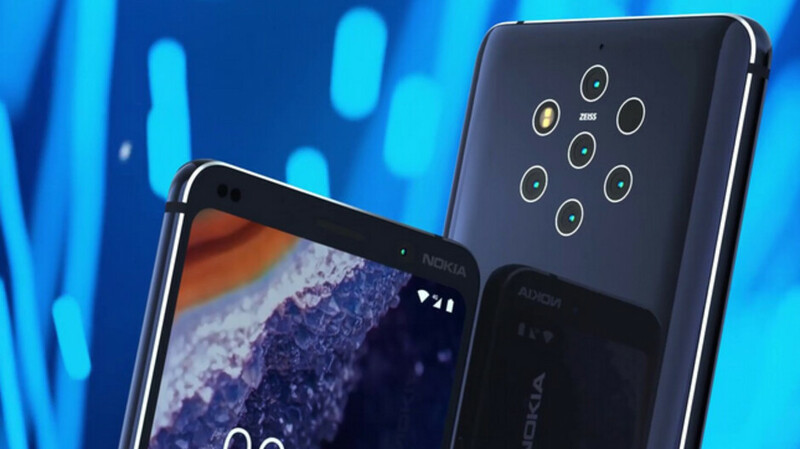 One of the most interesting devices expected out at MWC 2019 in Barcelona in a few days is undoubtedly the Nokia 9 PureView. Rendered a couple of times already, as well as leaked in full in a very thorough promotional video a while ago, this bad boy has been getting shutterbugs extremely excited with a one-of-a-kind five-camera setup on its back. But despite that and the inclusion of other ultra-high-end features like in-display fingerprint recognition, the newest Nokia-branded flagship may come up short in several key departments when pitted against Samsung's Galaxy S10, the LG G8 ThinQ, or Sony's Xperia XZ4. In line with previous reports, a pre-release Nokia 9 benchmark surfaced yesterday in the Geekbench Browser database lists the handset's motherboard as the "SDM845." No prizes for guessing which one of Qualcomm's state-of-the-art processors we're dealing with here, but although the performance scores of this Nokia 9 prototype would have been perfectly adequate for a late 2018 high-ender, most flagship phones around the corner are pretty much guaranteed to make the move from a Snapdragon 845 to the hot new 855. Early Galaxy S10+ benchmark results suggest Snapdragon 855-powered devices could be twice as fast as their 845 forerunners in terms of single-core muscle, while delivering roughly 25 percent more multi-core speed. Of course, those performance gains might end up even higher in commercial phones, not to mention real-world capabilities aren't always accurately reflected in synthetic benchmarks. All that being said, the Nokia 9 PureView still looks like a powerhouse right now, edging out the Galaxy Note 9, Galaxy S9, and LG G7 ThinQ with a solid multi-core score of almost 8,800 points. That tells us the unit tested through Geekbench runs polished software (naturally based on Android 9.0 Pie), looking essentially ready for a commercial launch after its MWC 2019 formal announcement. Last but not least, we're certainly glad to see the handset packing 6GB RAM. That confirms the recently leaked 4 gig variant is not the only one in the pipeline, putting smiles on the faces of heavy multitaskers around the world. No word on an 8GB configuration, though. I wouldn't put too much stock in benchmarks. Those are just numbers on paper. This is running stock Android, so it shouldn't be slow compared to the resource heavy S10 and whatever ridiculous names LG is calling their phone. The XZ4 may kill it though since Sony is pretty much stock iirc and it specs pretty much wipes the floor with the Pureview. When comparing other specs, including with those smartphones running the SD855 like the Xperia XZ4, one can hardly say that "it *has specs that pretty much wipes the floor with the Purview", considering they both have the same amount of storage configurations, while the N9PV has a 5 camera setup compared to the XZ4's 3, a higher resolution front camera, and an in-screen fingerprint scanner compared to the XZ4 not having an in-screen fingerprint scanner. The N9PV also runs pure stock Android, while the XZ4 does not run pure stock, but comes close. Optical onscreen finger prints scanner are slower compare to conventional fingerprints scanner.Ultrasonic Fps will be the best match for it which S10 trio & note 10 will be having it.Sony stock android is still good than lg,huawai,Samsung one ui. In-screen fingerprint scanners are the future, whether someone likes it or not. It's the way tech is going. On paper, it looks more advanced, and putting these two unreleased smartphones against each other, all one can do is go by how it looks on paper. We are comparing Stock Android vs Sony's UI, so I don't know why you mentioned LG, Huawei, and Samsung. For the record, all three have feature packed UI's. I prefer the traditional FPS, but onscreen is good only if it's as good as the best, the 6T. The in-screen fingerprint scanner on the 6T isn't the best. It's hit and miss. No, it’s not the best. Tests prove it. It's just my honest opinion. Calm down, it's not that serious. We get that you're excited for the Pureview, but that doesn't mean everyone has to share your over enthusiasm for it. I just gave the "honest facts" about the subject. Calm down, it's nothing for you to get so dramatic about. We get that you feel the need to complain on just about every HMD article, but that doesn't mean that everyone has agree with your unjustified complaints. No, you just saw the need to needlessly attack my comment just because you disagree with what's been said in it. You are the only one who is getting dramatic as you saw the need to post it twice and give yourself a thumbs up. Lmao stop being so dramatic. I posted facts, that’s all. You’re getting all triggered because it’s me that posted them, and now you’re jealous because people like my comments as opposed to yours. Grow up, already. Same message posted twice because? Because none of your business. Cant wait to see how the camera performs in real world, wide angle & multi optical zoom, is all i ever wanted in a mobile phone do finally ditch my 5x optical zoom digital camera. Of course the Galaxy S10 will perform better, considering it has the newer, more powerful SD855 compared to the SD845 in the Nokia 9. This should hold true for just about any device using the SD855, so to compare it based on performance is ridiculous. The good thing is that it runs just as well, if not better, than today's flagships using the SD845. HMD and Xiaomi are the two OEM's that I am most excited for at MWC. The Mi9 is sure to be an amazing smartphone, better than the likes of the XZ4. Even midrange SOCs are fast enough today. You're not going to notice much difference between an sd845 and sd845 device. I was starting to notice my battery life deteriorate when I had the S9+. I wanted to stick with it, but a combination of several minor annoyances tempered my enjoyment of it. I wish Nokia had released the 7 Plus here in the US as I would have "copped that jawn" easily. Heavy skins and carrier bloat can bog down an operating system over time. I'm just glad the s9+ is "universally unlocked" so that I can easily switch carriers, should I get one. I understand that carrier bloat and heavy UI can slow a phone down over time. It doesn't take a geek to understand that one. I understand that some don’t know what carrier bloat and heavy skins can do to a smartphones performance. It’s something that most figure out in a flash, but not everyone is quick on the uptake.